CNC drilling fast & accurate. Like milling, CNC drilling is one of the most important machining processes in the CNC industry. The CNC programming of drill holes in metalworking has meanwhile been almost completely automated. An in vectorcam integrated drill assistant handles the complete drilling process, from centering to lowering. Once defined drilling operations consisting of several individual drilling operations can be stored and reused at any time in other files. 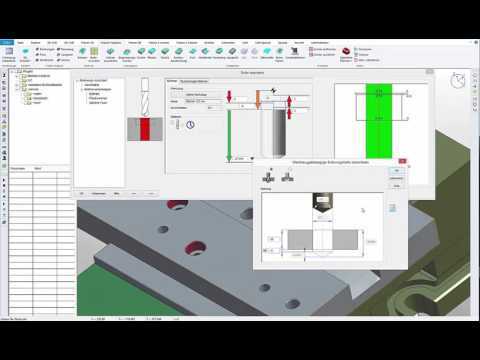 The drill assistant allows even faster programming of a variety of holes. The calculation of the drilling depths is based on the selected cutting geometry. For 2D data, a layer structure is created using the selected geometries. On a 3D model, an automatic drill hole detection including its diameter, as well as their depth, takes place. The optimum travel distances between the holes are then calculated automatically. In the first step, the user chooses the type of hole. Subsequently, in a further step, the shape, the size and the desired operations are selected. After that the user will be guided through the dialogues. Of course, the user always has full control and can intervene in each individual process, modify and adapt the automatically generated data according to his individual requirements. The user is also assisted by pre-set hole tables with various information such as e.g. different thread types, diameters and depths for lowering of screw heads and many more. The standard scope of vectorcam also includes extensive drillhole tables. Im Standardumfang von vectorcam sind des Weiteren umfangreiche Bohrungstabellen enthalten. These can be adapted at any time by the user to the company's own standards and requirements. Moving the local axbox to the respective hole level is eliminated.vectorcam automatically detects the z-height at which the holes are located. The respective Z-height is also automatically forwarded to the new drill assistant. In this video, we introduce our new drill assistant, which has been renewed for vectorcam 2016, which speeds up and simplifies CNC drilling. In this video you will find useful functions, tips and tricks for working with our drill assistant.